We had a good launch last week for ProfHacker.com, the website that Jason B. Jones and I dreamed up this summer and then created with a superhero team of great writers, thinkers, and hackers! 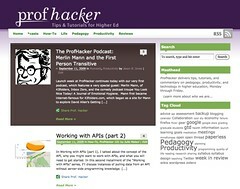 ProfHacker delivers tips, tutorials, and commentary on pedagogy, productivity, and technology in higher education, Monday through Friday. Who’s going to ASECS 2009? Have I forgotten anyone? Planning to come? Let us know your plans. I’d especially love to hear from other 18th century bloggers to see if we can manage a rare face to face meeting. I’ll be in town Friday afternoon, staying through Sunday. For the program, click here [PDF]. Thanks for this, David! I was just checking in to see what might have been posted on the conference. I’d very much like to be part of a “meetup” of eighteenth-century bloggers. I arrive on Thursday just in time for my first time slot, and then I’ll stay through Saturday late afternoon (or maybe Sunday early morning… I’m driving). If blogging had been around when I was thinking about (and then in) grad school, I very well might have gone into the field(s) of composition & rhetoric instead of eighteenth-century studies. I’ve benefited immensely from reading the blogs of numerous comp/rhet people over the last 5 years, and I now have a much fuller understanding of just what the field involves. I teach first-year writing every semester, now, and so I thought it appropriate to attend the annual meeting of the Conference on College Composition and Communication, which is in New Orleans this week. Please gmail me if you want to do the blogger meetup thing. Below is my session; I’ll be on a panel with 2 of UMKC’s finest grad students. Panel Description: Disability studies is a growing field in composition recognizing responsibilities of writing instructors to incorporate pedagogies of inclusion and accessibility for all students and instructors. Scholars such as Brenda Jo Brueggemann, Sharon L. Snyder, and Cynthia Lewiecki-Wilson have opened a dialogue of disability rhetoric and an ongoing need for instructors’ awareness and understanding of disability in the writing classroom. In this panel three composition teachers share their personal experiences with disability in the classroom. Speaker 1 addresses living with mental illness, teaching “madness narratives,” and the effects this has on classroom dynamics. Speaker 2 explores how students with disabilities served as a catalyst for revising her teaching techniques giving all her students the opportunity to succeed. Speaker 3 looks at how anxiety and depression affect writing instruction and classroom community. These papers take place in the important and ongoing dialogue of student/instructor disability and teaching writing. Mental illness can “hide” in the classroom unlike physical disability. Instructors and students may easily veil their illness. In Disability and the Teaching of Writing Wendy Chrisman shares her experience disclosing mental illness to a student. She acknowledges that inherent risks abound when disclosing a mental illness to students. I teach mental illness narratives and am quick to discuss the ongoing stigma of mental illness and a need for society’s acceptance of people diagnosed as such. I do not, however, openly discuss how I, as a graduate student and an instructor, live with Bipolar Disorder. I fear that disclosure will undermine my authority in the classroom and challenge my ability to effectively teach writing. In my paper I look at how teaching disability studies should create an open dialogue of how all people, student and instructors included, are affected by disabilities; however, the prejudicial and stigmatized social view of mental illness complicates this. In this presentation I explore how my experience with disabled students taught me the importance of a flexible pedagogy and how a greater understanding of disability and rhetoric expands both instructors’ and students’ concepts of identity and the body. On the first day of class an instructor hardly expects to encounter students climbing over desks; however, one student with Asperger’s Syndrome did this. While I was surprised I refrained from reprimanding her or drawing attention to her ongoing “strange” behavior as the semester progressed. She did not reveal her disability to me nor did the Student Disabilities Office. I was perplexed and uncertain about teaching this student and helping her develop her writing skills. This was not the only class in which students sat in the classroom silent about their disabilities. University policy gives students the power to disclose their disability. While I recognize the importance of student choice in this matter, I also know this is problematic for the graduate teacher who has not been trained in pedagogies of inclusion. Offering students alternative ways of responding to peers’ writing, working in groups, and taking part in class discussions involved daily adaptation that often felt like the accommodation debated and argued against by some Disability Studies scholars. Flexibility worked for me; however, training in pedagogies of inclusion addresses classroom realities before the semester begins. Depression and anxiety exist in a dual capacity that hinders our understanding of them as illness and disability. They are not only temporary states of mind that everyone experiences in response to physical and environmental stimuli, but also serious disorders that may become debilitating. Psychologist George Brown describes eloquently the relationship between the two disorders: “Depression is a response to past loss, and anxiety is a response to future loss.” For many students in the classroom, every less-than-perfect grade received is a painful failure, and every new assignment is a future opportunity to fall short. Some respond to these stimuli as no more than passing unpleasantness, and some find them almost completely disabling. This presentation argues that the choices we make in our teaching need to take into account the psychological impact assignments and feedback have upon students. A writing pedagogy designed to accommodate the needs of students disabled by depression and anxiety serves the needs of all students. Furthermore, instructors who suffer from disorders are particularly well positioned to empathize with students’ experience and develop effective teaching strategies. I ask because as the new school year begins, I’m considering starting a pseudonymous blog instead of (or in addition to) this one. Blogging (academic and otherwise) has changed since I first started the old blog in March of 2003. And my life has changed drastically since then as well. I no longer feel like I’m a part of the academic blogging conversation. WorkBook has largely been personal the last few months, which is ironic given that I started it with the intention of making it even less personal than Thanks…Zombie was. Clearly I need to blog about personal stuff, but I’m not sure this is the best venue for it or that you are the best audience for it. I’m sorry for subjecting you to such angst-ridden, video-indulgent posts over the summer. Some major revelations and realizations took place recently, though, and somehow I woke up a week ago in a very good mood that is not going away. I feel good. I feel optimistic. I’m excited about the new semester. I can see myself using WorkBook to write about my teaching and research, but the personal stuff is going to be more problematic. Here’s why: much of the tumult of my recent life has grown out of my marriage, divorce, and subsequent related events. And soon, I’ll be going on actual dates with actual people. I very much need to write about these things in a blogging environment with reader response. But since it’s not too hard to figure out who I am (and more importantly, since some of my readers know the other people involved in the tumult of my recent life), it’s not fair to these other people to write frankly about personal stuff. So I’m toying with the idea of a pseudonymous academic/personal blog. I have made the jump to WordPress to run this blog. So far, so good.